WATERLOO: Fifty-nine works by fledgling and established artists from in and around Waterloo feature in the Orchard Gallery’s final exhibition for 2018. Curated by Catherine Skipper, convenor of the arts committee at South Sydney Uniting Church (SSUC) and arts and theatre reviewer for the South Sydney Herald, the community exhibition opened on November 24. Waterloo Lucky Dip caps off a successful year for the gallery in which it also hosted four strong solo exhibitions showcasing the works of Jovana Terzic, Tamara Maximova, Bea Spry and Rosalind Flatman. Mr Collis’s mixed media piece, “My father’s watch”, appears in Waterloo Lucky Dip alongside oil and watercolour paintings, ceramics, collage, drawings, poetry, decoupage and other works by the more than 20 artists exhibited. Jim Anderson’s works, “Lady have a heart” and “Billboard Marilyn or Sitting on top of the world”, are notable for their whimsy and layered detail. Their gentle playfulness holds the faintest traces of the countercultural clash that saw Anderson jailed in the UK in 1971 for his part as a co-editor in the publication of the notorious OZ 28, the School Kids Issue. He and his fellow editors, Richard Neville and Felix Dennis, were later acquitted of these charges on appeal. Grace Wilkinson’s work, “Separation”, is a stirring depiction of a family in distress. It conveys the rupture the young Grace experienced when her life was split between Australia and Greece after her mother separated from her father who was very ill.
Ms Wilkinson, who trained in Athens and Sydney, has guided the Waterloo Mob for several years, teaching its members artistic principles and encouraging them to cultivate their own styles. 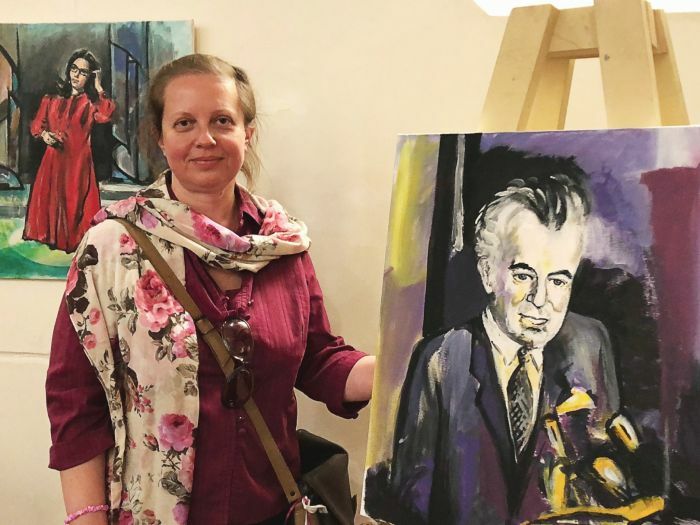 She said she’d painted the portrait of Gough Whitlam that features in Waterloo Lucky Dip because she liked the former Prime Minister of Australia and how he’d fostered a fairer Australia. She’d painted the Greek singer, Nana Mouskouri, because of her soft voice and because she represented “the connection I have with the west”. Sharon Lang’s portrait of a red-head bears a striking resemblance to the pre-Raphaelite beauty, Elizabeth Siddall, who died at 32 in tragic circumstances. Ms Lang has lived in the local area for 37 years but only recently discovered the Orchard Gallery and the SSUC’s Saturday art classes. A minimalist abstract painting by Hayley Megan French, artist-in-residence at SSUC, is featured from her series I’m trying to remember where I was so that I know where I am. Shadows lurking beneath the work’s foggy white wash hint at the ways memory can shape our perception of place and landscape. Soon after she moved to Matavai tower, Ms Skipper joined the art class at SSUC, and she’s been part of it ever since. Through eight years of involvement, she’s met many wonderful people like the artist Gaylene Smith and “the master of the dragonfly representation” Carolyne May. Waterloo Lucky Dip is at the Orchard Gallery, 56a Raglan Street, Waterloo, until January 12, 2019. To see the exhibition, phone 0415 491 937.